Dorothy Laboucane had chosen so far this week not to speak to reporters. 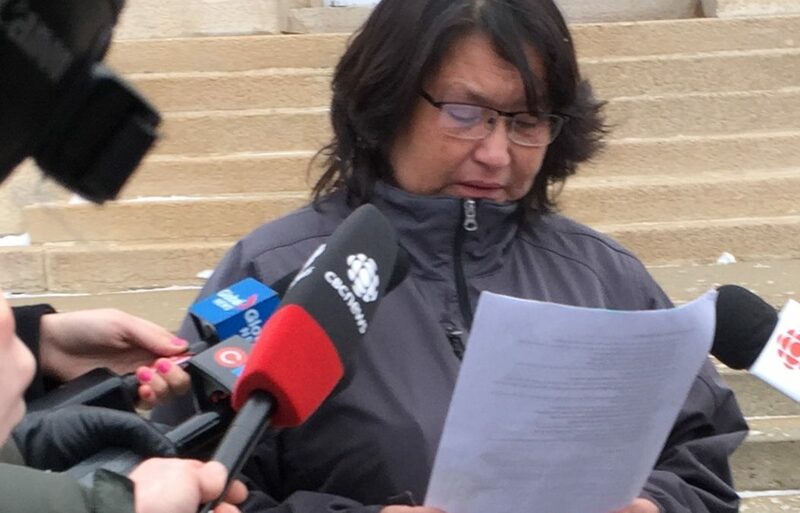 However, following the testimony of the officer who shot and killed her son in October 2017, she gave an emotional victim impact statement on the steps of the Battlefords courthouse. Laboucane says if Constable Jerry Abbott had just used a little better judgment on the night in question, her son would be alive today. Whitstone’s mother says she thinks her son chose to flee from police in the white Buick LeSabre he was driving because he was in breach of his probation conditions including being out after curfew. Police mistakenly believed the vehicle Whitstone was driving was the one which had been identified in a drive by shooting earlier in the evening. She says regardless of any recommendations that come out of the inquest, it wont’t bring back her son or provide justice. Throughout the day, the inquest heard from RCMP officers who were on the scene in the moments after the now badly damaged car Whitstone was driving came to rest at the intersection of 105th Street and 15th Avenue in front of the Academy of Learning College. Moments before this, Whitstone had been involved in a short high speed pursuit with police through the streets of North Battleford. The jurors had previously heard Whitstone’s car had collided with RCMP vehicles on at least two separate occasions and was now incapable of exceeding a speed limit of more than six miles per hour. Officers also testified even though the air bags had been deployed and the LeSabre was virtually undriveable, Whitstone continued to put the car in drive and reverse creating what appeared to be a slow rocking motion back and forth between two trees. Constables Marco Johnson and Greg Hugo told the inquest officers were yelling at Whitstone repeatedly telling him to put his hands up and get out of the car but to no avail. Both the driver and passenger side windows were smashed out by police and pepper spray administered but Whitstone and passenger Amanda Wahobin remained in the car. Johnson and Hugo said they tried to apply what is called an arm bar technique on Whitstone’s left arm in an attempt to wedge him out of the car but were unsuccessful. By this time, Cst. Jerry Abbott, who had picked up the dispatch of the 911 call on his way back from Sweetgrass First Nation, was approaching the front of the vehicle with his revolver drawn. Abbott told the inquest he didn’t really notice the two officers standing on the driver’s side of the vehicle but was almost solely focused on the driver. He said he decided to take the lead because he was in the best vantage point to shoot Whitstone without hitting the other officers. Abbott said he was almost ready to re-holster his weapon as Whitstone had both hands on the steering wheel and it appeared he was ready to give himself up. However, he said as he got closer to the vehicle Whitstone turned away and began digging into his pants for what he believed was a gun. The RCMP constable said after Whitstone looked him straight in the eye and then began to dig deeper into his pants, he made the decision to discharge two bullets from his gun into his chest. Abbott said he fired the second shot because Whitstone was still moving after the first and he believed still posed the danger of retrieving a gun. Johnson and Hugo then pulled Whitstone from the car and began applying chest compressions in an attempt to save his life. However, he died a short time later.